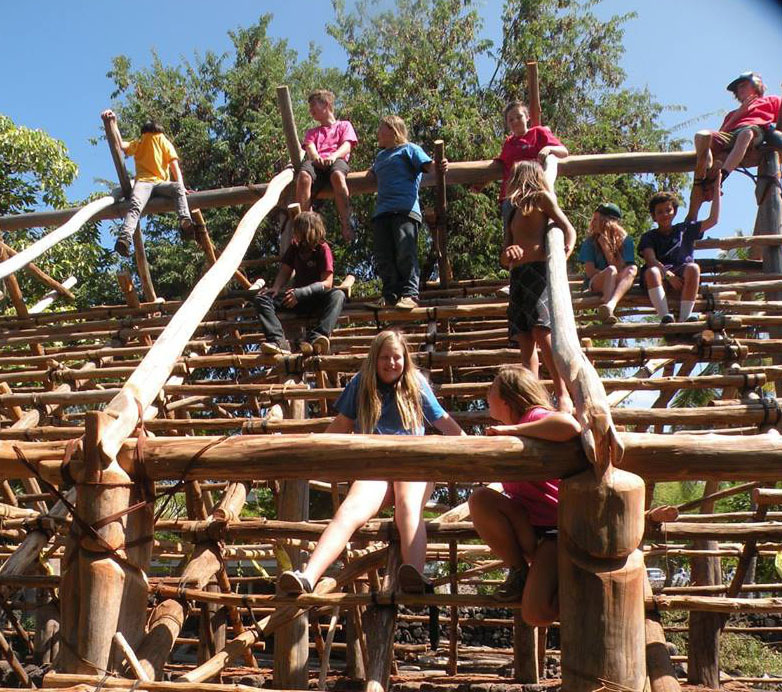 Kona Pacific Public Charter School in da Hale! After our January lashing workshop, Uncle Waltah and our haumana, Lot, Randall, James, Paul, Iwikao, Jeff, and other volunteers worked on lashing the roof in preparation for our March 11th thatching workshop. 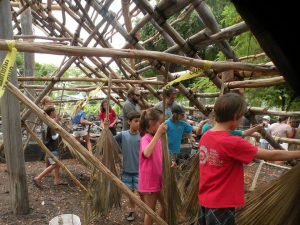 The 5th & 7th grade classes from Kona Pacific Public Charter School in Kealakekua also visited and learned basic lashing while helping to prepare and bundle the loulu leaves for thatching. 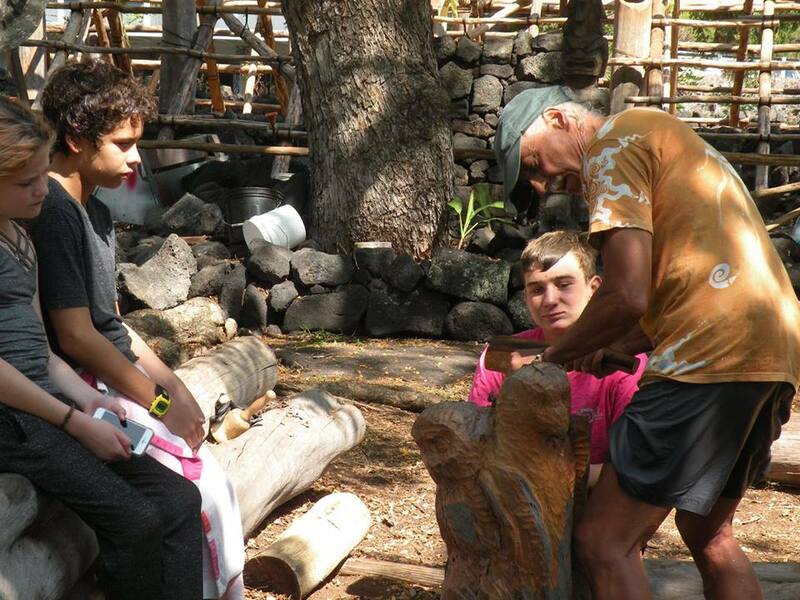 Visiting artist Mark Andrew of Eugene, Oregon spent great part of his one-month vacation carving out an ‘Io, a Pue’o and ‘Auku’u (native Hawaiian birds of this area) from an ‘ohia log. His beautiful carving now graces the hale grounds. Mahalo to all our volunteers for their enthusiasm and kokua! 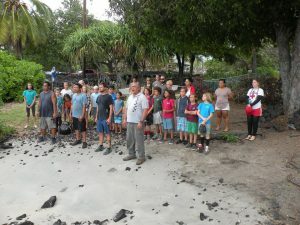 Kona Pacific Public Charter School 7th grade students doing the project team for morning protocol at Kapuwai, adjacent to the project site. 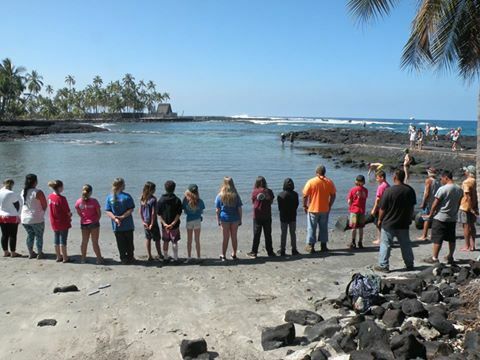 Kona Pacific 5th graders at morning protocol at Kapuwai.